For a satisfying midweek supper, try this creamy chicken, red lentil and cashew nut curry, made with all organic ingredients. Heat 1 tablespoon of the oil in a large pan and add the onion. Cook for 8-10 minutes over a gentle heat, stirring occasionally, until softened. Stir in the garlic and spices, and cook for 1-2 minutes more. Add the remaining oil and the chicken, and cook for 2-3 minutes each side until coated in the spice mixture. Stir in the stock and lentils, bring to the boil then cover and simmer for 25 minutes, stirring occasionally until the lentils are tender and the chicken is thoroughly cooked. Stir in the soya yogurt and cover, then simmer for a further 5 minutes. Meanwhile, heat a small non-stick frying pan and toast the cashew nuts for 2-3 minutes, stirring regularly until they are golden brown in colour. 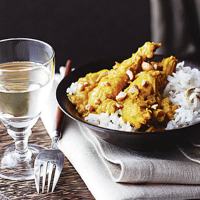 Spoon the curry into individual bowls with basmati rice, and top with the toasted cashew nuts. For a vegetarian alternative, at Step 2, swap the chicken for chopped vegetables such as cauliflower, sweet potato or butternut squash and cook until tender. You could also stir in organic spinach when you add the soya.